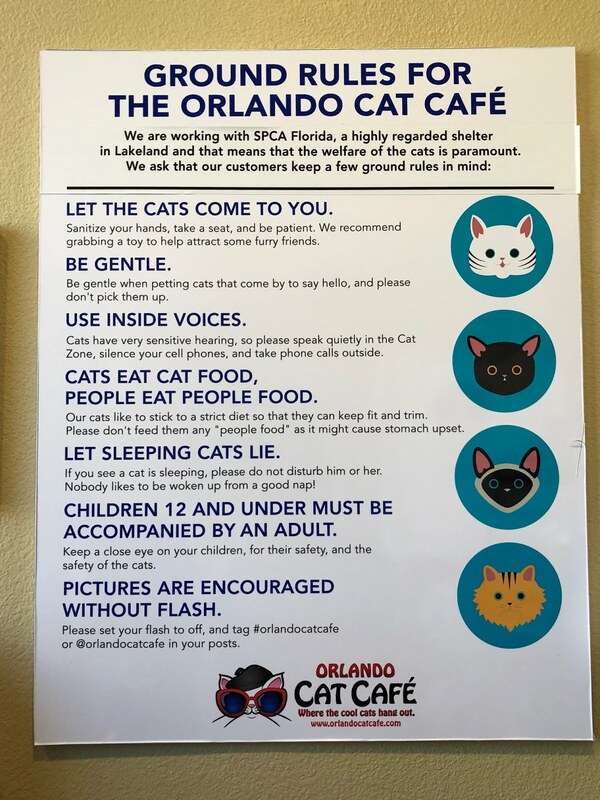 Orlando Cat Café is Central Florida's first Cat Café. 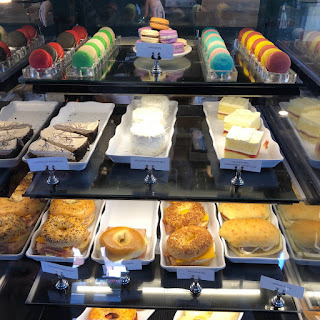 The cafe is located four miles from Walt Disney World's Animal Kingdom in the Town Center at Cagan Crossings. 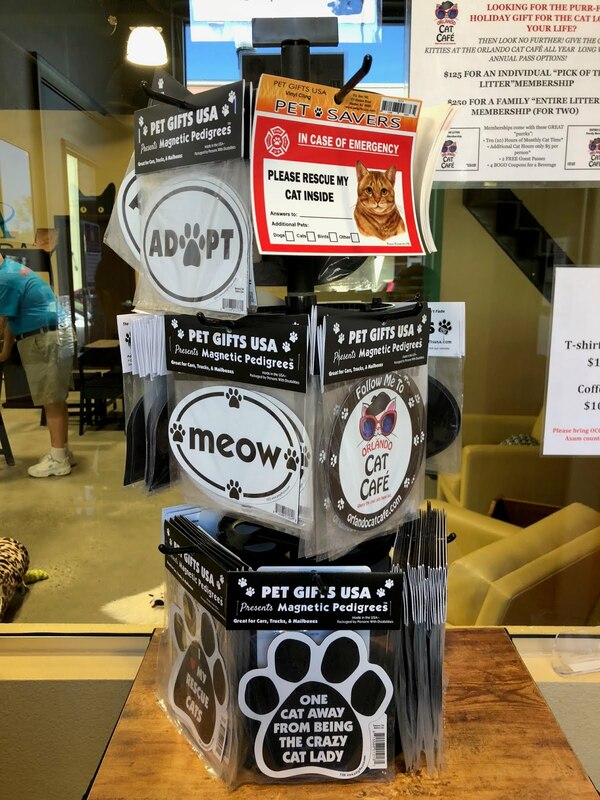 The Orlando Cat Cafe is a three-way partnership between the Cagan Management Group, Inc, Axum Coffee and SPCA Florida. The regular Axum coffee menu is available as well Croissants, Quiche, Paninis, Bagels, Scones, Muffins, Brownies, Cookies, and Cheesecake. 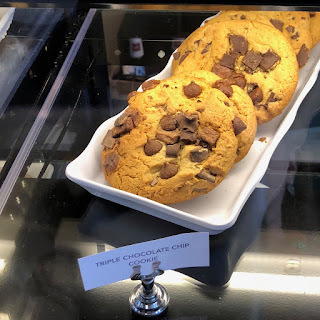 A few gluten-free items are available for purchase. There is a small fee to enter the Cat Cafe: $8 adults/$4 kids under 12. 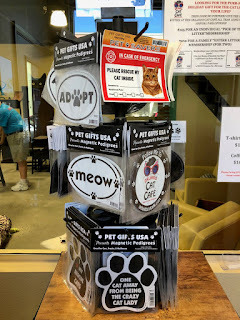 You pay this fee at Axum Coffee and you are given a sticker that allows entry to the cat play area. 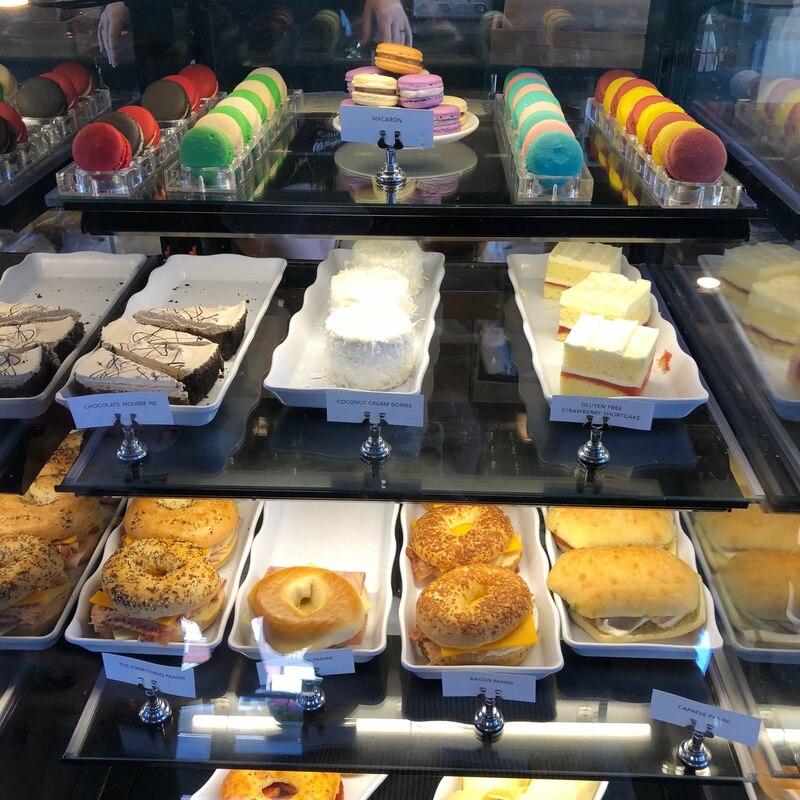 Reservations are suggested (especially on the weekends), but walk-ins are welcome if there is space available. Guests are allowed one hour in the Cat Cafe. 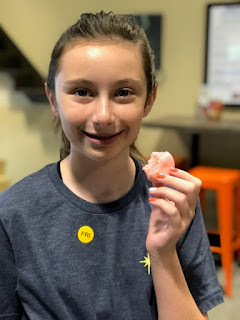 So let's go play...but first you need to sanitize your hands and get an overview of the rules from a SPCA Florida volunteer. Moo Moo stole the show! She loves being around people. Like humans, each cat has a different personality. Some are quiet and shy; others are playful. Felix is an older cat who enjoyed being scratched behind his ears!. Sophie was a sweet girl. There is a "Kitten Tent" which my kids just loved! 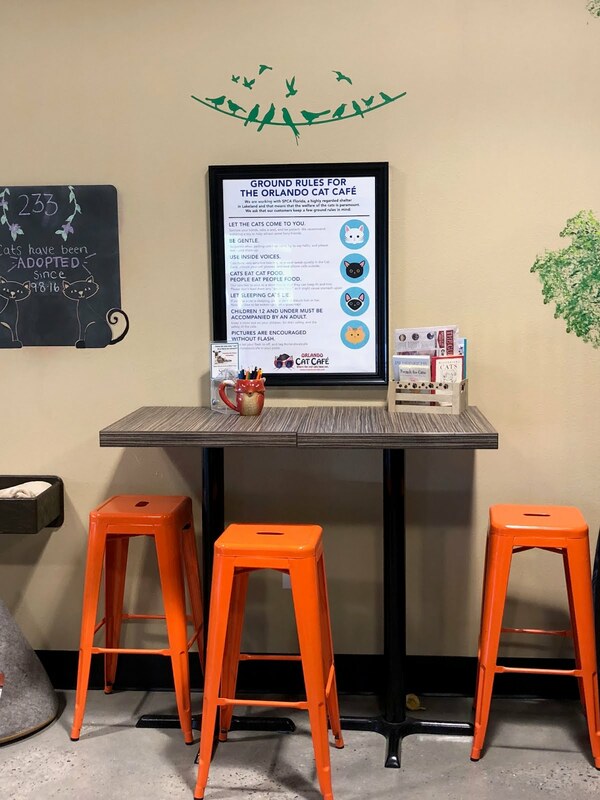 The Cat Cafe is closed on Mondays as that is the day the adoptions are processed, but the coffee shop itself is open seven days a week. There are a few gift items for purchase including car magnets, tee shirts and coffee mugs. The Cat Cafe will celebrate it's second anniversary in September and it's no wonder this place is still so popular. It's the purr-fect way to relax with a cup of coffee. 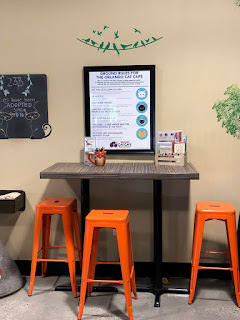 Want to learn more about the Cat Cafe? 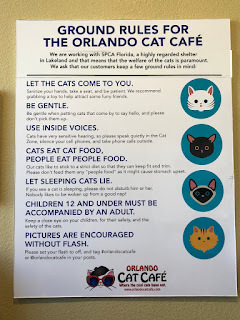 Visit: https://www.orlandocatcafe.com.